Sure – I love mango. Maybe I’m crazy for it. Maybe I’m on the record as saying that I wish my diet was pretty much mango and nothing else. I may have even made a tag for all mango themed products I’ve reviewed called “MANGO!”. For these reasons, and more, I am really not sure what to do with myself right now. Folks, I don’t know how else to say it, but we are in the FIRST EVER TRADER JOE’S MANGO MADNESS SEASON. MANGO MADNESS! MANGO MADNESS! MANGO MADNESS! What it is: Nice taffy that tastes like mango. Worth it: Yes, if you like mango and taffy. Pumpkin Madness? That I can handle. Over time I’ve started to come to terms with Trader Joe’s annual pumpkin deluge – the October tradition of stocking the store so full of pumpkin derived products that they spill from the shelves and choke the doors. What I was absolutely not prepared for is my favorite fruit in the entire world, getting the same treatment. My hands are quivering, I’m still breathing hard – and I went in the Trader Joe’s YESTERDAY. Guys, every aisle – every nook and cranny – is absolutely bursting with mango products, each item more outlandish than the last. I should be thrilled – swinging from the lamp posts – but instead I find a strange uneasy churning in my stomach. First, I’m not sure my grocery budget can take the strain of purchasing every new Mango product. But even more nervous-making, I’m worried for the mango itself. Pumpkin is one thing. Pumpkin is the dependable, workman-like squash of the vegetable world. You can do anything to pumpkin and it won’t complain – mash it, roast it, puree it, spice it, candy it, press it for oil – whatever. It’s a mellow gourd with an unassuming, laid-back taste. Mango, on the other hand, is a diva. Bright, brilliant, succulent and oh so deliciously sweet, mango can only be done two ways – perfectly, or perfectly awful. A poorly devised pumpkin product might leave you non-plussed – but when someone does mango wrong, you end up with a repugnant horror. 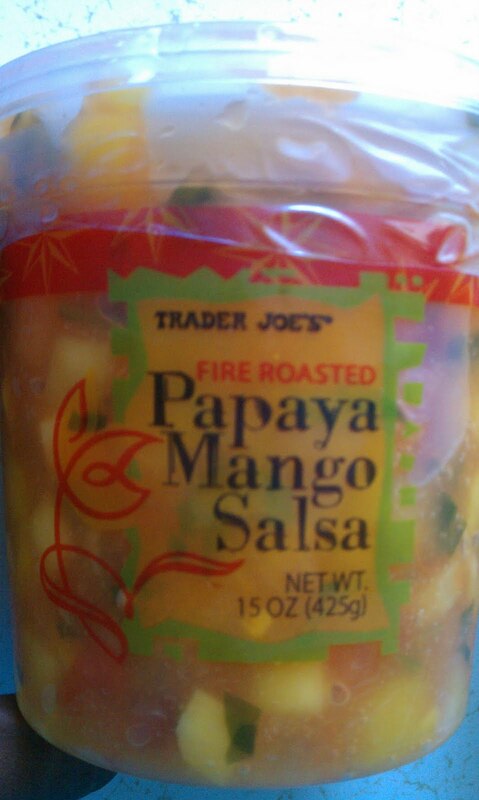 This is what I fear – that Trader Joe’s will abuse mango so horribly that they actually ruin my favorite fruit for me. Each new item I pick up is like another spin at Russian Roulette. I’m sure most of these will be great, but at some point I’m bound to find something lethal. Or will the sheer quantity of new products include enough duds that I swear off mango forever. So which side of the line does Trader Joe’s Mango Taffy fall on? I’m happy to say that this Mango infused candy is delicious. Taffy is rarely ever truly good or truly bad – most of the time it’s just that sweet, chewy sugar-dough you stick in your mouth when you’re on vacation somewhere rustic. The body of this taffy is just fine – a nice consistency, but unexcpetion. Not too hard, not too soft – malleable and almost yielding to the tongue. The mango flavor is pleasantly flavorful and strong. Taffy makers are fond of claiming they have all manner of flavors – a veritable encyclopedia of tastes encompassing every fruit and confection under the sun – but tend to deliver only about 3 or 4 distinctly different tastes among a sea of sweetness. Trader Joe sidesteps this pitfall – delivering a mango taffy actually tastes like mango. Close your eyes and concentrate and you can nearly taste the juiciness of a nice bite of ripened, succulent mango flesh. It’s not quite there, obviously, but it’s a fair simulacra, and certainly deserving of the mango name. The price is reasonable, to boot. 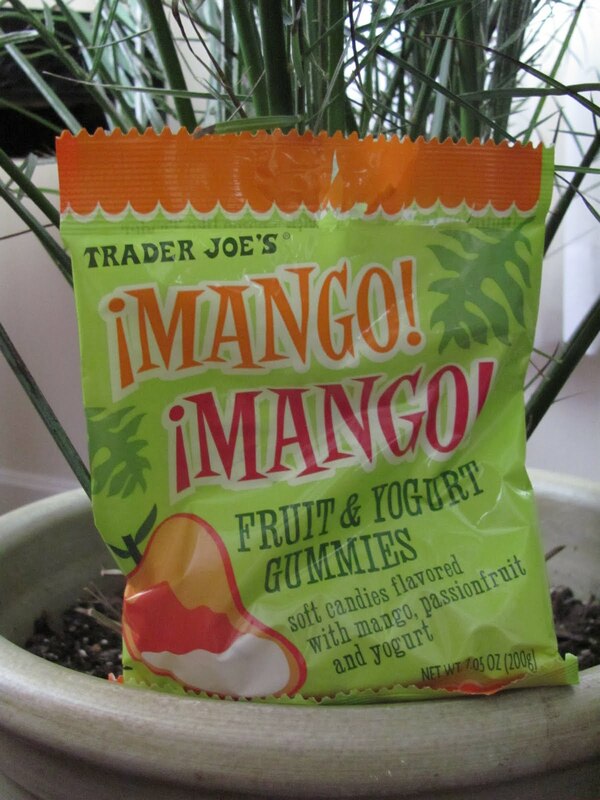 If you’re looking for a confection that will really blow your socks off, you could do better in the magical candy aisles of Trader Joe’s, but if your a mango fan or a taffy fan, you’ll not go wrong picking this up. Would I Recommend It: Sure – this is pretty good taffy. Would I Buy It Again: Yeah, I guess so. Lives Up To The Name “Mango”: Yup – real mango flavor in these taffies. Final Synopsis: Good mango taffy. No, mango probably wasn’t meant to look like that, but my is it tasty! Trader Joe’s Crispy Crunchy Mango Chips are the answer to the unasked question of “What would happen if you just kept on dehydrating mango?” The result? These dehydrated, crispy (and, yes, crunchy) mango chips bring you all of that sweet mango flavor, without getting your fingers sticky. 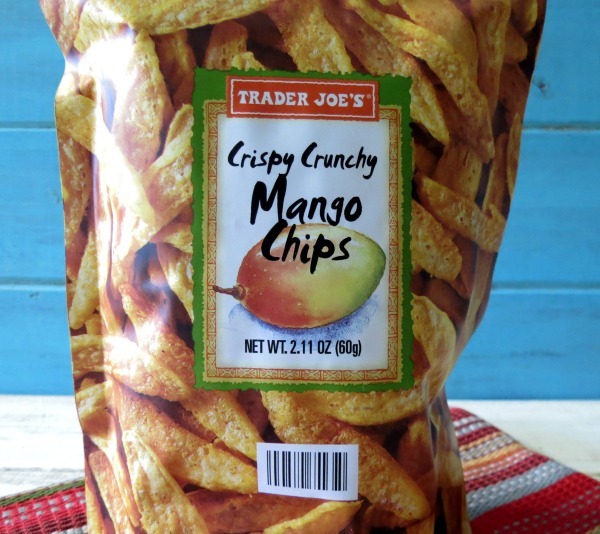 Crispy Crunchy Mango Chips are just the latest addition to Trader Joe’s “Crispy Crunchy” fruit snack line. Previously we looked at TJ’s Crispy Crunch Jackfruit Chips and ruminated in an abstract way if it was possible to cook jackfruit bonda with them. While the jackfruit chips didn’t blow me away, the second I saw this new mango variety I knew I had to pick them up. Long time readers of this blog know that I have a certain, pathological addiction to that sweet, heavenly expression of nature’s golden teet also known as MANGO. I will lie for mango. I will steal for mango. If you get in between me and that luscious fruit, I’ll even kill for mango. These may be simple tenets to live by but they’ve served me well or, at least, ended up getting me a ton of mango. I’ve held off on reviewing any mango based products for a while now (more than a year?!) because once those floodgates open, they’re hard to close again. In this case I relented, simply because dehydrated mango chips weren’t something I’ve ever seen before. Trader Joe’s Crispy Crunchy Mango Chips take whole slices of thick, succulent, juicy mango and dehydrates them down into little, withered, french fry-sized sticks. Surprisingly, this is actually much better than it sounds. The resulting chips end up being light and very crispy, with plenty of satisfying snap and crunch. These wouldn’t be great qualities in and of themselves, if it wasn’t for the intense mango flavor that is packed in each chip. Through the dehydrating process, TJ’s managed to retain and concentrate much of that sweet mango flavor. Snap into one and you’ll be shocked at how flavorful each bite is. They’re not as sweet as the actual mango itself, but they bear far more resemblance to it than you would expect – certainly much more than your average apple chip or banana chip bears to their progenitor fruits. 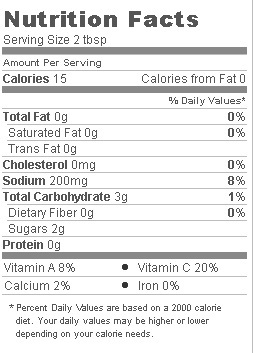 The fact that there is some slight reduction is sweetness is actually a good thing. A ripe mango can be so sweet that eating even one is overpowering. By moderating the sweetness, these chips become much more snackable. In fact, they approach the perfect index of snackability – packed full of flavor, sweet, crunchy, easy to eat, and portable. It’s easy to munch on just one of these chips at a time, nibbling one down and enjoying the experiencing before going back to the back for the next one – a much more enjoyable experience than jamming handful after handful of Lays potato chips into your mouth. I’ve never regarded dehydrated fruit chips as a particularly high-level snack . I’ve always felt they’re only really sold to people seeking a moderately healthier form of junk food. Since that defeats the purpose of junk food, and dehydrated fruit is often expensive, I’ve never really sought them out. These mango chips have turned me all around on the issue. These aren’t just another half-hearted substitute for genuinely tasty chips, they’re a superior snack food in their own right – more savory, more healthy, and more enjoyable than any bag of lays you’ll ever find. Would I Recommend It: Yes, these are a superior snacking experience. Would I Buy Them Again: I’d pick these up over a can of Pringles any day. 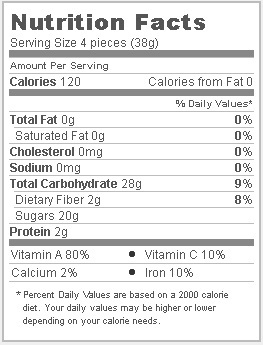 Final Synopsis: Tasty, simple, dehydrated snack food with loads of mango flavor. Guys, I’m sorry. I’ve got nothing for you today. I bought this even though I knew I wouldn’t have anything to say about it. 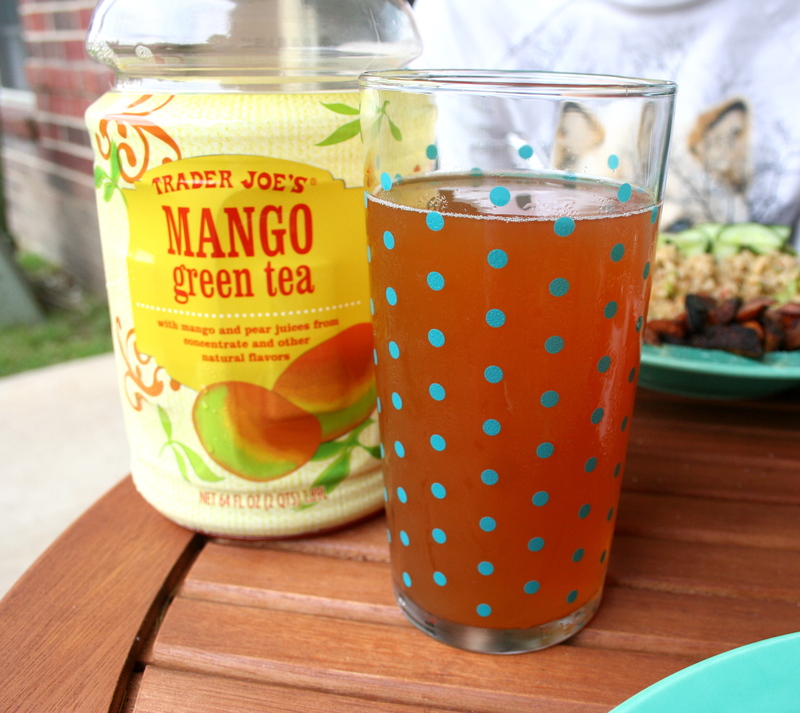 Mango green tea tastes exactly how you think it tastes. Like ice tea with the nice flavor of mango juice in it, and a mellow, lingering mango after taste. There’s not much more to add. You know lemon flavored tea? Like that, but with mango juice instead. It’s good chilled, and I recommend it. That’s all I got. Listen, I knew I shouldn’t have bought that dried green mango, but I thought I could handle it. I always think I can handle it, but mango has me locked tight in its grasp once again. I twist and writhe in the throes of my mango lord, my mango god, as it occupies every shape around me, blinding me with it’s majesty, looming out at me from every shelf and corner in Trader Joes. “Mango!”, it shouts, unreasonably, as I browse for items to review. Shut up mango, SHUT UP! You will not control me. This is it, this is the last of my unending mango madness. No more – you hear me. Leave me alone!! GET OUT OF MY HEAD!!! Would I Buy It Again: Get away from me, Dark Temptress! Final Synopsis: Like Plutonium or LSD, mango is best used in small, regulated amounts, and with a healthy respect for its dangers. A little mango here and there can make life worth living, but to make it the corner stone of your existence is to wager recklessly with the Devil. Just mango is good enough for me. Let’s talk delicious mangoes. My ongoing, free-verse tribute to my intense love of mangoes continues today with this lovely dried, unsweetened and unsulfured variety I picked up. 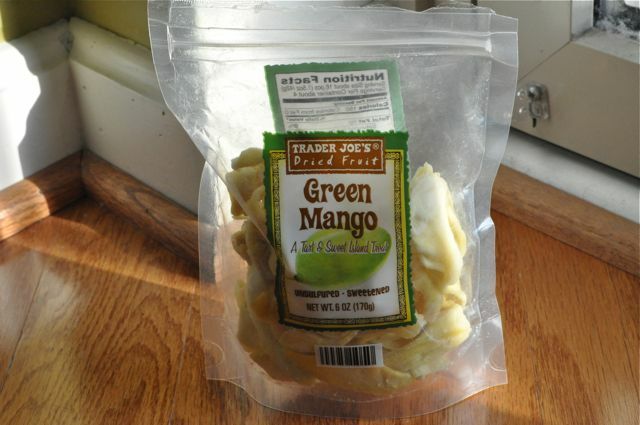 There is a wide world of difference between the dried green mango I enjoyed the other day and these. 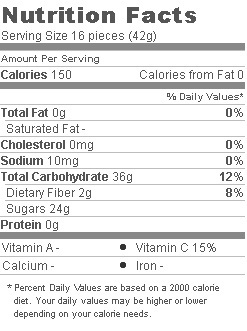 Why does sweetened mango abound so? 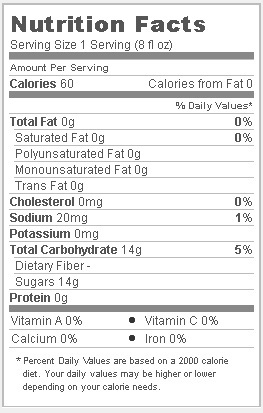 Is not dried mango sweet enough on that it can glide blissfully over our tongues without being pumped full of glucose? Having only rarely seen unsweetened mango, and never tried it, I didn’t know – but eager to find out. The answer is a resounding yes. Not only does the absence of extra sugar make the snack more healthful and diet friendly, but it allows the natural fruity flavors to delicately emerge. Without the disguising taste of a sugar coating, I found I could actually distinguish a different taste in the slices depending on how close to the core they had been cut – sweeter and sunnier from outside, more reserved and green tasting at the core. 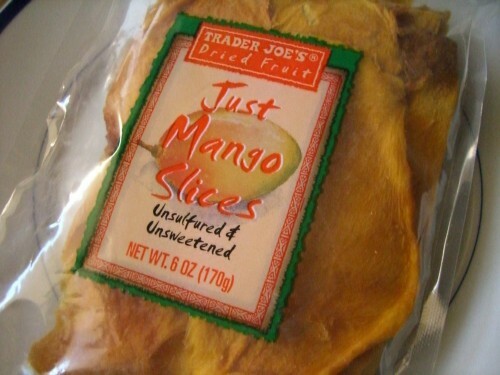 The slices themselves are stiff, broad flaps of fruit of drab whitish yellow – very different from the bright candy yellow-orange of sweetened mango. I found the change in color rather appealing, much like with Trader Joe’s Green Protein, if something is going to be healthier for me, I expect it to look more natural to boot. In fact, over all I found these a better buy then your regular, dried sweetened mango. Enough sugar already, I say. Let the mango speak for itself. Plus it’s unsulfured, so that’s a plus, but more on that tomorrow. Are their any downsides to today’s dried mango? Is it even possible to conceive of a mango-related flaw? Yes, it would appear. Through an astounding exercise of willpower I managed to savor these over two whole days, and had the unhappy surprise of finding the pliable mango slices of the night before become increasingly stiff and leathery the next day. Within 24 hours of being opened, the mango slices had become about as difficult to bite off and chew as an old boot. The taste remained as delectable as ever, but eating them became an increasingly arduous task. If only Joe had packaged these in a resealable bag instead of a disposable one the whole issue could have been avoided. If you buy these, be sure to transfer them to a sealable bag upon opening, that’s my advice. Would I Recommend Them To You: Yes, with the above proviso. 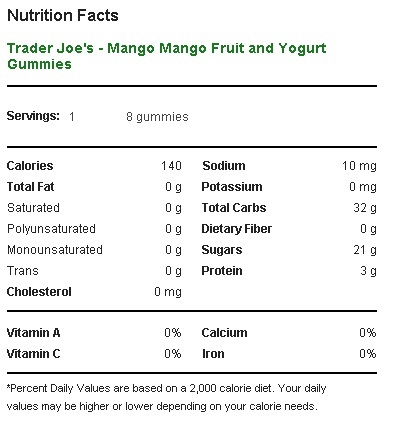 Would I Buy Them Again: Over sweetened mango? Every time. Final Synopsis: Sweetened mango’s healthier older brother. The sophisticated man's choice for gummy candy. Mad mango-rama continues with Mango! Mango! gummy candy. Other than being a big fan of the bag’s enthusiasm for it’s contents, I wish I had more to say about these. They are gummy candies that come in a three flavors – mango, mango-yogurt and passionfruit-mango. As is usually the case, the flavors names promise a little more than the factory can put out, and the candy’s actual taste bears only a passing resemblance to their namesakes. Not that I blame them – only some sort of insane simpleton would expect a gummy candy to taste just like the real thing – I’m just saying is all. Is this good gummy candy? Yes. Is it the best gummy candy you’ll ever taste? No, but it’s reasonably excellent all the same. Does the stupid name put me off? A little. All three types of gummy are pleasantly fruity and flavorful, and the pieces are large and thick enough that even one makes for a nice mouthful. The texture leans a bit more toward rubbery than gooey, which is what I personally prefer from a gummy candy. In fact, after munching on these for a few minutes I started getting sore temples from the vigorous chewing action. Now that’s a substantial gummy. What makes these gummies stand out in the battle for your recession dollar? Not a whole hell of a lot, but what they’ve got they do well. They exist mainly to fill that niche in the life of adults who still love the unique, addictive qualities of gummy candy, but feel self-conscious about buying Haribo’s tiny pouches of cartoon frogs and peach rings, or whatever. Joe can also proudly boost that his Mango Mango gummies are made form real fruit, with passion fruit and mango juice concentrate being the primary the flavorings in the mix. We can add to that one other interesting ingredient – elderflower berry juice – not as flavoring, but as the source of coloring to give the candy it’s fruity hue. Like our Italian Blood Orange Soda, no red 42 is to be found here – just wonderful, all natural secretions of Earth. How cool is that. Though it may be outlandishly nerdy to admit as much, Trader Joe’s use of non-artificial coloring agents is quickly becoming one of my favorite things to look out for. Would I Recommend It: For you’re gummy dollar, it’s worth it. Would I Buy It Again: Though gummy is not my first candy choice, I can forsee these in my future. This one’s is easy to explain. Imagine you are eating a piece of dehydrated mango. Now imagine it’s a little more tart than usual. That’s about all there is to say for this simple snack. Green mangoes are, as they sounds like, mangoes which are harvested before maturity. In the wild these would be unedibly tart, but after the miracle of dehydration and with the liberal addition of sugar they hit the spot. I loved these and ate them up at a pace so dangerously quick that I’m putting a prohibition on myself from buying them again too soon. If I didn’t, there’s more than a small chance that my diet would quickly slide into a sort of all-dehydrated-green-mango binge, and that my friends would soon find me, naked, fat and dead, in a room littered with empty mango pouches, a fistful of dehydrated mango wedged half-way in my mouth. The fact that, if at all possible, I would marry a mango and engage in passionate love making with my mango bride probably makes me more susceptible to the sweet and tangy wiles of this fruity snack than others, but I don’t hesitate to recommend it all the same. The tangier green mango provides a nice change of pace from the super sweetness of normal dehydrated mango, and does so without losing any of that potent mango flavor. The only small issue I had was that I was hoping for a tarter zing than the green mango delivered. The pack-promised tartness manifests as a subtle undertone rather than a pyrotechnic blast, but it’s hard to get too bent out of shape over a product that tastes as good as this. Would I buy it again: Yes, but only while carefully self-monitoring. Final Synopsis: Like regular dehydrated mango – but better!